I've got a gorgeous polish from the recent Slayer Collection created by the lovely Maggy of Daily Lacquer! Now I'm a huge fan of blue polish and Spike so this immediately screamed "buy me!" 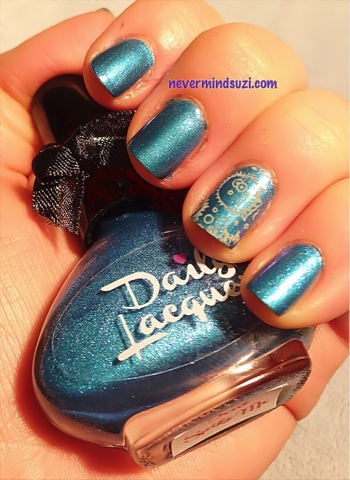 Don't Spike Me is a metallic electric blue full of shimmer! It's got a lovely duo-chrome effect also. 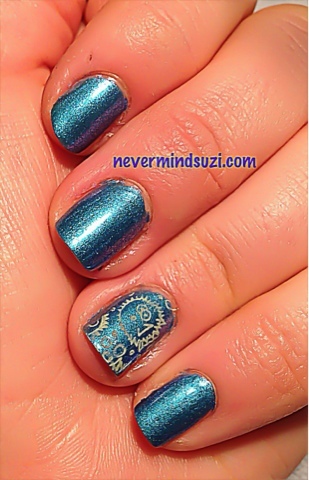 I decided to make the most of this beautiful blue and stamp some aquatic themed fun over it. So cheeky plate CH38 was used and this cute little puffer fish design. Unfortunately a lot of the yellow (Lime Crime - Crema de Limón) is lost so next time I'll try another. This was one of those mani's that I really was reluctant to remove.